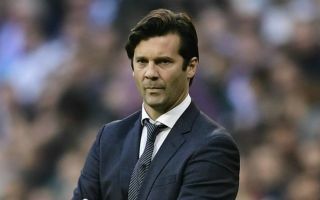 Real Madrid have reportedly decided that Santiago Solari will face the sack, as soon as they identify and are ready to appoint a successor. The Spanish giants have essentially seen their campaign fall apart over the past week or so, as back-to-back defeats to Barcelona saw them knocked out of the Copa del Rey, while they are now 12 points off the pace in La Liga. That was followed by a 4-1 defeat at home to Ajax in the Champions League, and so they are staring at the very real possibility that they will end up empty-handed this season. According to ESPN, Solari has now ‘lost the support of the hierarchy’, and so the Argentine tactician is set to be sacked when Real Madrid secure a replacement. It’s added that Zinedine Zidane and Jose Mourinho have emerged as the two possible candidates for the job, but the former is said to be unlikely to return so soon after leaving at the end of last season. With that in mind, perhaps Mourinho will be the favourite for the job as he considers a potential second stint in charge at the Bernabeu. Either way, it has to be said that given their failures this season not only under Solari but under former boss Julen Lopetegui too, Madrid can’t afford to get this next appointment wrong. Further, there are ageing stalwarts in the current side who need to be replaced soon rather than later to ensure that the La Liga giants can maintain their success in recent years and build a new cycle immediately. As a result, the Real Madrid hierarchy need to make a decision and be fully convinced it’s a long-term solution, with Mauricio Pochettino and Jurgen Klopp also specifically noted in the report as options, but it’s added that neither are likely to walk away from their current jobs any time soon.